Haq's Musings: Are people of color less intelligent? Apparently, this is a compilation of data from "credible sources" and published in respected journals such as American Journal of Psychology. The neutrality and factual accuracy of these studies and data have been questioned by many researchers and scientists. The most common criticisms are that these studies and tests are developed in the European context and they measure mainly problem-solving capability and skills. For those who are curious, Pakistanis are included along with Indians in Southern Asia with an average IQ of 84, about 16 points below Europeans and almost 21 points behind East Asians including Chinese, Japanese and Koreans. This data indicates that the context and the environment do have an impact on the IQ test results but they do not completely erase the difference. However, the debate continues with lots of questions as to the design, the content and the bias in IQ tests. 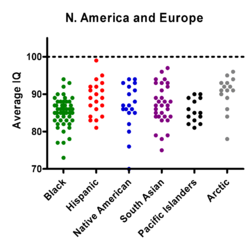 With an IQ of 123, Barack Obama is well ahead of the average of 100 for whites and 85 for African-Americans. For comparison, McCain's IQ is 133. For all practical purposes, McCain and Obama are in about same range. However, both Bill and Hillary Clinton have higher IQs in the range of 135-140. ^^RH: "Here is a little trivia in response to the worst of the right-wing caste-ist Hindu racists and bigots who claim higher levels of intelligence..."